After living in the Bulkley Valley of northern BC for 20 years, I felt like we needed a local map - both for travellers who visit and for local people seeking to explore. This seemed like an ideal opportunity, as well, to experiment further with using Blender to generate shaded relief. This was quite a long project, begun in October 2014, and finally sent to press in April 2015. 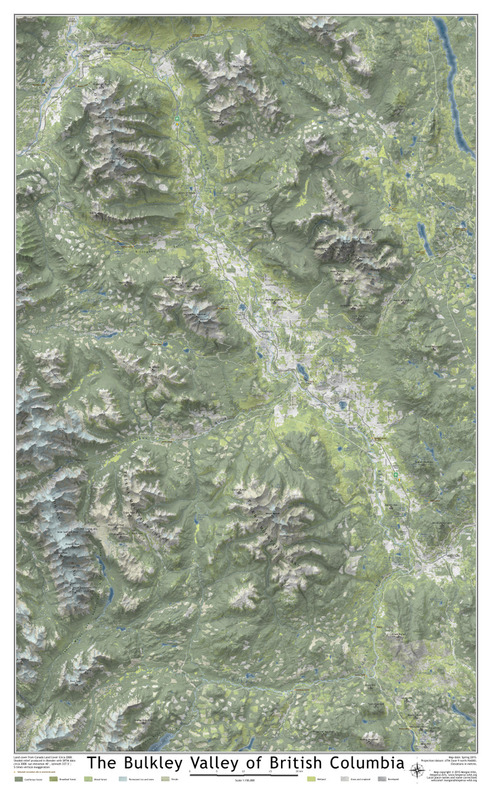 A large chunk of that time was spent perfecting the use of Blender to generate shaded relief, and another large chunk was spent reviewing sources of land cover data. In the end I chose SRTM DEM data, because it seemed to more accurately reflect the landscape than CDED DEMS; and I chose Canada LandCover because it seemed to be the most accurate (despite being 15 years out of date). The map was made in QGIS and finished in Inkscape. It's at 1:150,000 and measures 24" wide x 39" tall. What am I trying to do with this map? What kind of vision or story of the valley is it? Every map is a story and a vision, and this one is primarily a vision of terrain. It helps us visualize the space in which we live (or which we visit). The important things here are mountains, rivers and lakes. How they fit together: where they are relative to each other. Notably, the map is not a guide to recreation. That is, it doesn't say the Bulkley Valley story is a story of recreation. It's not a story where the main characters are ski areas, trails or backcountry cabins. It's not a story of fishing sites and river put-ins. It's not the story of all the forestry roads you can drive (or bicycle) to get to remote places. Those are stories that are important and should be told, but they're not what I'm telling here. I think I deliberately wanted to avoid the conflicts that come when one begins to portray recreation. Are you going to show the quad trails in addition to the hiking trails? Are you going to show snowmobile cabins in addition to hiking and skiing cabins? Do you show the bounds to snowmobile travel in the Babine Park? Do you show backcountry ski routes in addition to the ski areas with lifts? Do you offend someone who wanted a ski route to be secret? These are all questions I wanted to avoid.